Scuba Diving is often considered a dangerous sport. People that do not dive would often assume it is dangerous. It is classified as an extreme sport by most insurance companies. It is healthy to respect water. As humans we are unable to breathe underwater. Therefore a diver is dependent on their equipment and training in order to survive. This dependency leads to scuba diving safety rules. There are things that can go wrong with scuba diving, meaning it has to be learnt and equipment needs to be properly maintained. A diver needs to obtain the necessary skills and safety training to return safely from a dive. But don’t worry, it is very easy to learn. In Fact, 10 year old children can become certified scuba divers. So is scuba diving safe? Is Scuba Diving Risky or Dangerous? If we look at scuba diving risks & statistics, it actually fairs better than some very common activities. In fact Scuba Diving is safer than having a baby, driving your car, snowboarding or even bowling. Of course this is generalising these statistics. There are many more people having children and driving their cars than there are people scuba diving. However diving injuries & fatalities can often be traced back to diver error. In order to avoid diver error there are scuba diving rules. Easy to follow? I think so. How often would you walk down the street and just hold your breath for no reason? Continuously breathing means that you are continuously equalising your lungs according to your diving depth. This brings me to the next rule. Divers subject themselves to increasing pressure when diving. We never want to force equalise and should never feel any pain. I put together a helpful guide to equalizing your ears. If you don’t feel comfortable to do a dive for ANY reason, don’t do the dive. Increased pre-dive stress leads to diver error which in turn can lead to diver injury. Is scuba diving safe for non swimmers? Of course, but only under the direct supervision of a qualified instructor. I conduct many try dive programs with people who cannot swim. To get your license you need to be able to swim 200m comfortably and unassisted. So why not try diving and if you like it take some swimming lessons? What about those big, bad sharks? Hollywood has done a great job of making us fear sharks. They are the most feared animal in the world. However sharks are also the most misunderstood animal in the world. They are not interested in eating divers. They are highly intelligent creatures that have been on our planet for 450 million years. Is scuba diving safe from sharks? Yes, if you avoid cage dives and dive operations that feed & handle marine life. Now these are very easy to avoid. A medical clearance can be obtained from your doctor before your diving holiday. This already eliminates the number one risk factor when scuba diving. 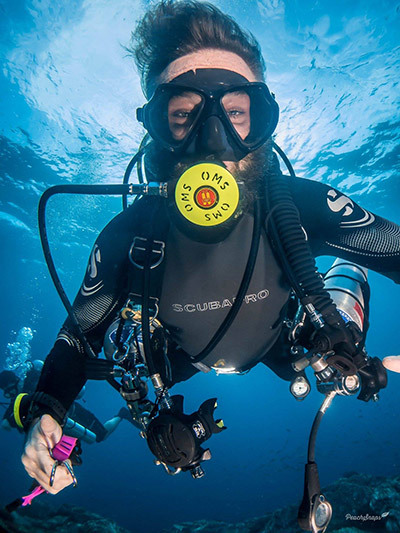 If you are new to diving, work on your buoyancy before tackling more challenging dives. There is no shame in doing a refreshing course if you feel a bit rusty on your skills. Rapidly ascending is never an option when scuba diving. Make sure you are comfortable before attempting an open water dive. Violent water movement can be assessed prior to the dive and should only be attempted by more advanced divers. How should you assess the risks of scuba diving? A lot of it is diver attitude. Willingness to learn the proper skills and dive in a safe manner almost eliminates the risk of scuba diving illness or injury. Scuba diving is not dangerous, however it is an extreme activity where you breathe underwater for extended periods of time. Therefore the proper medical checks, training, adherence to safety procedures and equipment are essential. Maybe you are questioning the safety of Thailand and Koh Tao? Why not read our article about safety on Koh Tao, written by the people that actually live here.